I love perfection, but find it so rarely. I want my house to be perfectly clean, I want my kids to have straight A’s, I want my kids to behave perfectly and never get into trouble, I want to look in the mirror and see a skinny, 40-something, I want no flaws in my sewing and knitting….you get the idea. I have learned to accept imperfection. My kids have taught me that. However, I don’t accept it that well in myself – especially in my creations. I recently completed a knitting project which was partially machine knit on my Ultimate Sweater Machine and partially hand knit. The pattern is a stylish, modern vest called Vestish. I whipped out the back on the machine last spring but there it sat all summer while I dealt with more of life’s imperfections (broken bones). When the kids headed back to school I worked on the vest front. The shaping was giving me some problems and I read and re-read the instructions…felt something wasn’t right, resisted the nagging voice in my head and forged ahead. When I proudly completed it and looked in the mirror (trying to ignore the extra 20 pounds) I realized I had made a mistake – a nagging, mistake! Most laymen will probably not notice it, but most knitters will and it bugs me. 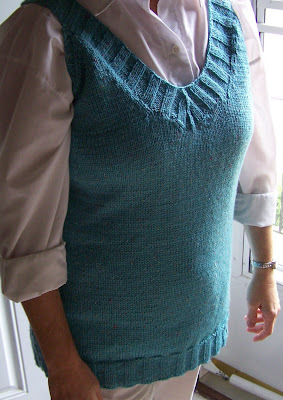 However, I am not sure it bugs me enough to undo the ribbing, undo the side seams and reknit….What would you do? I think I’ll eat a candy bar. Consider it your “signature” and not a mistake. Only God creates perfection. 🙂 Perfectionism can ruin all the fun (as a fellow perfectionist, I should know). Nope! I cant see it! !Love the colour! !